Cellulite, while not dangerous, is a source of unsightly embarrassment for many people. According to Web MD, cellulite occurs when fat pushes against the skin and creates a dimpling appearance. Some people associate cellulite with being overweight, but that is not always the case. Many people want to get rid of cellulite simply because they don't like the way it looks. While losing weight can sometimes help decrease the dimples in the skin, there are alternatives as well. Let's talk about natural remedies for treating your cellulite. You may be surprised by what you learn! Coffee grounds can exfoliate the skin and improve circulation which can prove beneficial with reducing the appearance of cellulite. According to Top 10 Home Remedies, you can make a paste with coffee grounds, sugar, and a small amount of coconut oil to massage into the skin. Top 10 Home Remedies describes dry brushing as a good way to promote circulation and improve lymphatic drainage. The improvement of blood flow can make the skin look more plump and lessen the appearance of cellulite. Juniper oil has been proven to detoxify the skin. Rapid Home Remedies indicates that toxins can build up in tissue and lead to the creation of cellulite. Removing toxins from the body can help curb the development of cellulite. According to Top 10 Home Remedies, seaweed can help exfoliate and improve the texture of the skin. All of this can help reduce the appearance of cellulite. Apple cider vinegar has a number of minerals including potassium and magnesium. 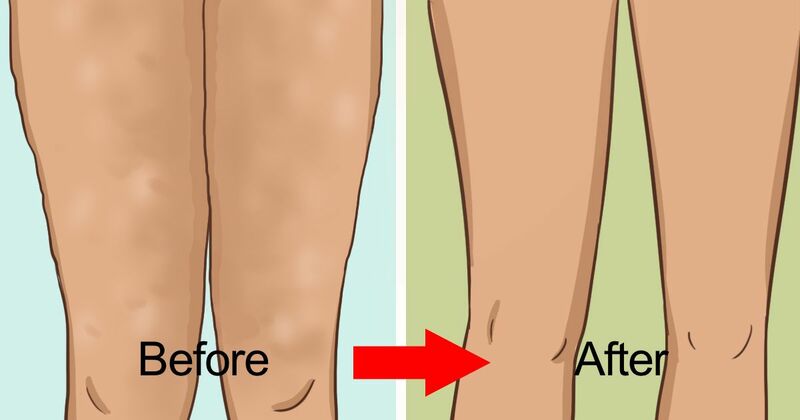 According to Rapid Home Remedies, the added minerals can help detoxify the body and reduce fluid retention in your buttocks and thighs which is where cellulite often develops. Rapid Home Remedies indicates that green clay is beneficial with reducing cellulite because it pulls impurities from the skin and promotes healthy circulation. Wellness Mama says that one theory about cellulite retention is because of a build up of toxins in the body. A detox bath can help remove harmful toxins and relax the body. A good option is an Epsom salt bath. Include a few handfuls of the salt in your regular bath water and soak for 15-20 minutes. Consuming salmon is a great way to fight back against cellulite. Top 10 Home Remedies describes salmon as being rich in antioxidants which can break down cellulite. Regular moisturizer can help keep skin looking great. However, over-the-counter products are likely to put more toxins back in your body. Wellness Mama indicates that you should opt to moisturize with coconut oil so that the body is not exposed to chemicals. Overexposure can cause the skin to be more susceptible to cellulite. Which method do you use for removing cellulite? Share with your friends.